Whenever you need fast and reliable network cable and components for analog, digital, wired or wireless data transmission, just contact us. We offer tailored, optimized solution for you needs and product portfolio, which reliability and operating efficiency you can trust. 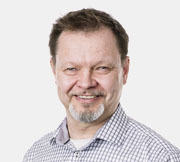 Founded in 1949 Finnish company Orbis Oy has been trading products of data transmission all these years. Orbis holds decades of experience in radio frequency and fiber optic technologies. Our own production makes it possible for you to get quickly and flexibly cable assemblies and other related products for individual needs. There are experienced professionals at your service. Each of us has a passion for working with customers and technology. You will get new, innovative solutions, which make your daily work easier and enable future success. 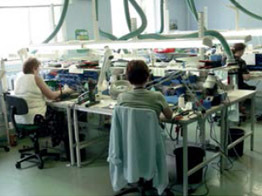 Our own production factory in Estonia at the city of Saue has been manufacturing data transmission products since 1999. There we process cable assem- blies with various connectors and combiner boxes as well as other configurations. We also provide total solutions for data transmis- sion applications, including power supply cables and connection boxes for active devices. Our cables are made with top class handicraft skills and constant quality, therefore they are reliable components for challenging applications. We hold more than 25 years of experience in fiber optic production. It guarantees for our clients a fast delivery and very high quality products. Orbis’s production is highly optimized, so you can get quickly both large and small batches of different fiber optic products. Orbis has decades of experience in RF – high frequency cables, which are used in a wireless network. Also we manufacture ourselves a big amount of RF jumpers. 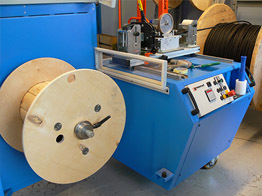 Our specialty is high standard cables, such as measure- ment and testing cables. You can also get from Orbis special cables, e.g. alarm cables for overvoltage protectors. Hybrid cables have a compound of several different technologies within one cable. For example, the hybrid cable in base station, carries information by fiber optic cable and power supply by copper cable to active devices. Data transmission devices usually need a power supply. We assemble for example 48 DC voltage electric combiner boxes. Typically they are used in antennas and base station masts located outdoors, as well as for example in control and alarm equipage. So products are required to have excellent frost and weather resistance. You can get all cables together with panels, combiner boxes and racks from Orbis in a turnkey basis. We trade these assemblies in collaboration with experts and flexible partners. There are plenty mechanical components for 19-inch racks. In cooperation with our customers we also plan what kind of products are necessary to use. Our high-skilled mechanical engineers are at your disposal. 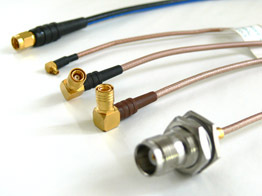 For example, cable splitter components are created with our own 3D printer. As a result we can offer solutions ready to be used in operation and in practice. Accurate testing is one of the cornerstones of our business, because we want to supply only the best. We have a diverse and modern measuring and testing equipment, which is constantly developing and expanding. Product batches are tested randomly. For those products, in which capability is very critical, testing can be made individually and provided with measurement documents. The measurement results are saved for at least seven years. Continuous testing guarantees that possible quality defects of products, manufactured by Orbis, will be detected immediately. If necessary we can arrange third party testing, such as environmental test. Our customers regularly audit our production, also the code of conduct. Finished products are identified by batch or serial numbers, which helps for example tracing the origin of the components, its measurement reports and batch information. Or production capacity of conventional cables is about 800pc RF cables per week and 3000pc fiber optic connectors per week (the beginning of 2016). The production of very demanding cable assemblies naturally requires more time. If necessary we can use our partner network to assist in some work phases, so capacity can be increased quickly. However the delivery time of materials has most impact to the production schedule. In case of special needs and big quantities we will predict the capacity need in cooperation with the customer. As soon as we know exactly what you need we can also guarantee punctual delivery schedule – we keep our promises! If the installation process must be done fast, - as it is typically done nowadays, do not worry, because we are prepared it. Partly completed manufactured goods and basic cables for different speed configurations, as well as connec- tors and mechanics are agilely ready in our production warehouse. You can also sign a temporary contract for storaging, which will include only products you need. As soon as the installation destination is confirmed, all products will be delivered directly on the spot. We combine all products to the one package, so your work in the site won’t be interrupted because of missing bolts, cable clamps or shrink tubes. Can you challenge our R&D? Tell us if you have in mind any challenges or needs for product development and we will start working with our strong technology competence. We are able to realize R&D project very agilely: at our best we have progressed from idea to prototype in a couple of days. The new product, which corresponds to your needs will be piloted and tested always in a real environment. This will offer the valuable informa- tion, for example about installability. After a new product is technically approved and successfully tested in practice, we will finalize it to be compatible in mass production.